My first issue was NO AcuraLink (AL) connectivity at all for the first 9 days of ownership. Whatever the issue was, the thing finally stirred to life late yesterday afternoon. Right off the bat, there were three very serious engine and system alerts sitting there after syncing the AL app with the car for the first time...the kind that tells you to pull over and call for a tow truck. What?? With only about 250 miles on the odometer, 100 of which was from driving home after buying it and going back to troubleshoot the connectivity problem (nothing was found wrong with car itself). There is nothing of the sort on the instrument panel that corresponds to the alerts. The service department said I could probably ignore the false alarms, and sure enough, they just disappeared on the app a couple of hours later. WELL... Everything seemed fine for a while, but then tonight it came back with the same alerts plus seven NEW ones for a total of TEN (10) very, very bad engine and system supposed problems. That was earlier tonight, and now just a few minutes ago it's back down to three. Again, nothing in the car itself when I go look at the instrument panel, ODMD, etc. This is really crazy and affecting my new car experience in general and feelings towards Acura specifically. I hate that because I've always thought so highly of Acura. I was excited to finally have the opportunity to actually own one for the first time. Anybody have any idea about this? The Blue Button people don't know, so I will have to wait until Monday to speak to the right people. 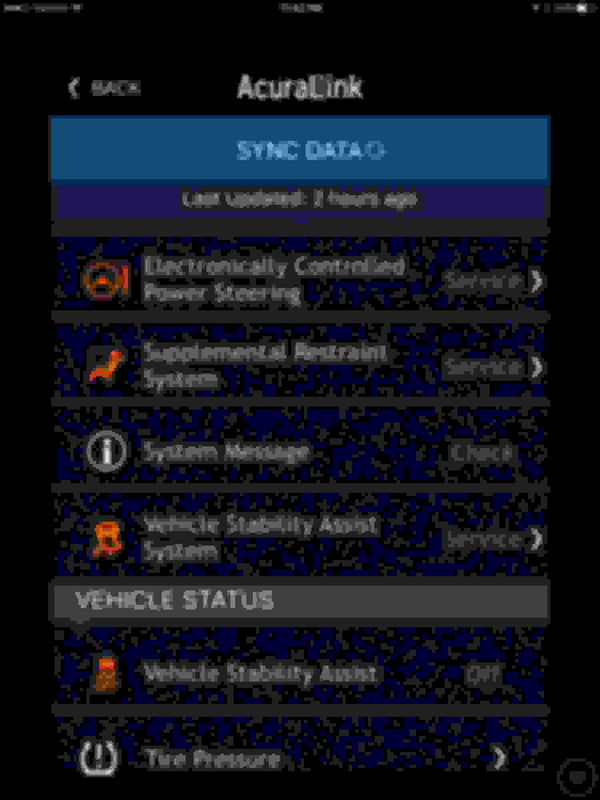 I found that Acura Link reports the last data that was available when the ignition was last turned off. So for example, checking AL in the morning will show the tire pressures from my last drive the previous evening, and not the current morning pressures which are usually much lower. My thoughts are that if If you just turned the ignition off after your last drive, the AL will not report any lights (problems}..But if perhaps you had the ignition turned on, but the engine not running, maybe to listen to the radio, all the warnings that were on the dash when you finally turned off the ignition, will be reported to AL. I think I understand what you're saying. I know that when you first press the start button without your foot on the brake to start the engine (like you said, to listen to the radio, or whatever, on accessory mode before starting the engine), most, if not all, icons light up momentarily in the operational sequence - and some would stay lit while listening to the radio. And, you're saying, whatever was lit before I eventually turn the ignition off could be what's being reported to the AcuraLink app. Hmmm... It sort of makes sense, and if that is truly what's happening, Acura needs to fix it pronto. Totally defeats the purpose of providing owners legit reasons for concern about what's going on with their vehicles...that they truly and absolutely need to stop what they're doing and go have critical safety issues and / or component failures taken care of before something really bad happens. Thanks for this thought; something I can ask Acura Technology Services or the service department about. Again, this is all very disconcerting as a new-to-the-brand Acura owner, so hopefully I can get past this situation soon and really start enjoying my new RDX. I consider Acura Link an application that lets me view the dashboard remotely. When I am planning a trip, I can check my tire pressures, fuel level, oil life, etc., all while sitting in the living room without the need to go out to the garage and look at the dash. Well at least I can see what those items were when I last turned off the ignition. If my tire went flat, and someone siphoned all the gas from my tank overnight, I would not be aware of those changes. So if all those warnings were on the dash when you left the car, a remote look at the dashboard should show the same things. I know what I am saying is true for the tire pressures, fuel level, etc., and it is only my theory that it would also apply to the idiot lights. Check it your self by letting the engine run until all the warning lights have gone out. Now turn off the ignition immediately and check Acura Link again. Hey, you're a brilliant man. I just tested your theory while sitting in my RDX with the engine running and no service lights on and then syncing the app. Thank you! Now I can go and enjoy my new car! Someone needs to make this a Sticky. It sounds like the app is defective. 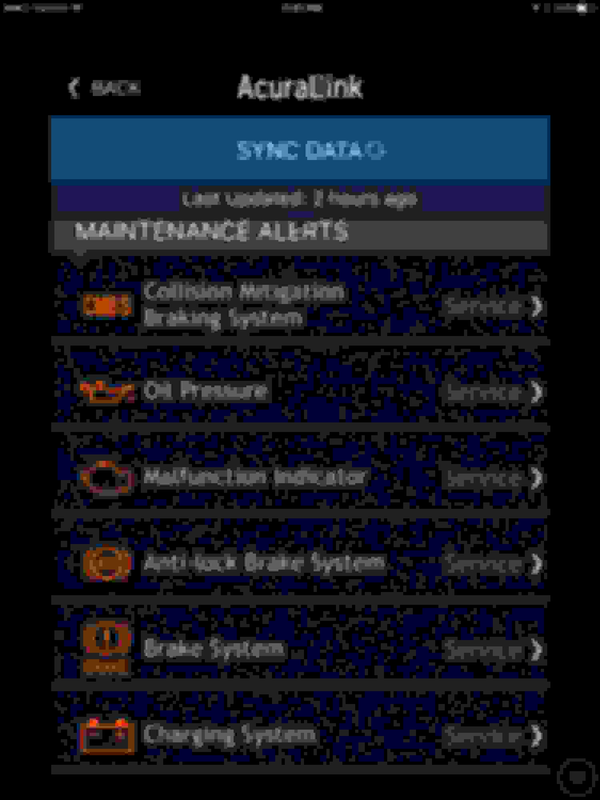 It shouldn't be giving you alerts unless there is a corresponding issue in the car itself. i agree that the app should be smart enough not to do what it's doing. Never should it default to sending alerts based on what flashed momentarily on the instrument panel during the the start engine sequence or when you go on accessory mode (a normal behavior) just prior to turning the ignition off again. I will ask about this. Certainly some bugs in these cars. We, like you. have had a less than optimal experience with the car so far. The new issue is the "Driver 1 key" frequently isn't recognized by the car. Keyless access by touching the door handle doesn't work consistently and the settings in the car don't change when the car is started. Just when I hoped the issues were settling down this one started up. This is an old thread, I know, but I found the touch system doesn't work when the fob is on the outside of my iPhone in my pants pocket. A quick pocket shuffle so the fob is closest to my thigh and it works consistently. Just an observation. I have alert that tires are low, I went to a tire store they checked pressure and there is nothing wrong, link app continues to report low tires and to replace all tires.??? ?what shoulf I do? The first question I have, is the App reporting the same pressure as the dashboard display? 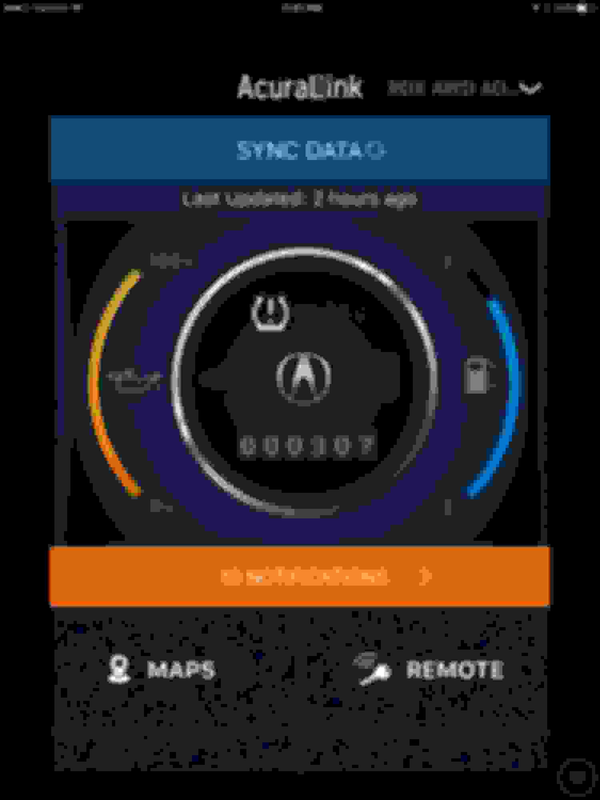 If they are different, then you need to remember that the app will show the tire pressures when the RDX was last turned off. When you restart the RDX, it will update the dashboard display within a minute, with the current pressures. This characteristic has been the primary discussion of this thread. This method can make it look like the App does not agree with the dashboard. 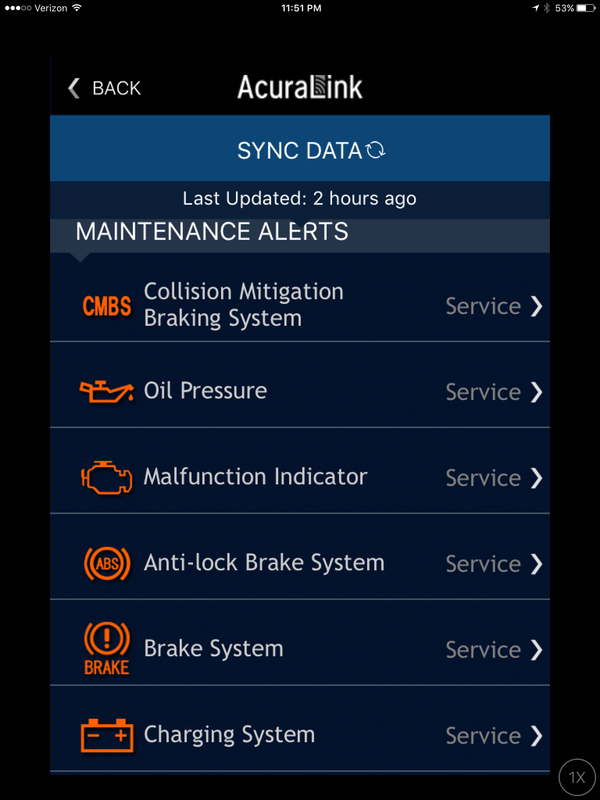 If you check the app while the engine is running, then the App readings should be identical to the dashboard reading. If the dashboard reads low pressure in the morning, and reads normal by the time you reach the tire store, that is normal as well. Tire pressures are always at their lowest in the morning, before the car has been driven on the road. After driving for some time to the tire store, tire pressures normally rise and eventually they may reach the correct pressure. So despite that your tires read the correct pressure at the tire shop, the pressure readings are not correct because they were taken at the wrong time. Buy your self a cheap gauge and measure your tire pressures first thing in the morning before your drive anywhere. Do not count on your dashboard readings when adjusting tire pressures, because when you make a change in tire pressure (add or remove a little air), the dashboard may not show the new value for up to 1 minute later. This will result in you adding more and more air because you do not see the pressure rise immediately.